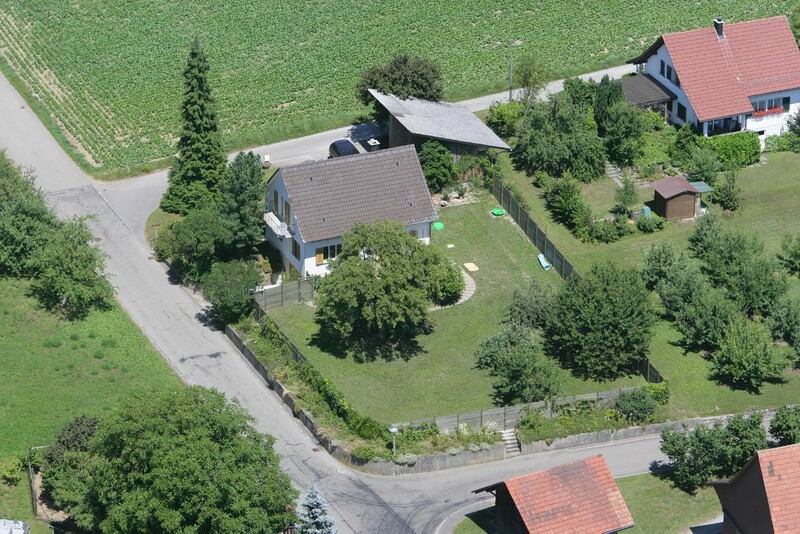 SOKOLOW is a small passionate kennel situated in the northeastern part of Switzerland. 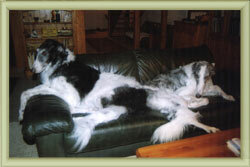 I only breed a few litters and those with the goal of continuing my bloodlines. All my borzois live in the house and garden with much personal contact and attention, and therefore I never have more than 3-5 borzois at the same time. 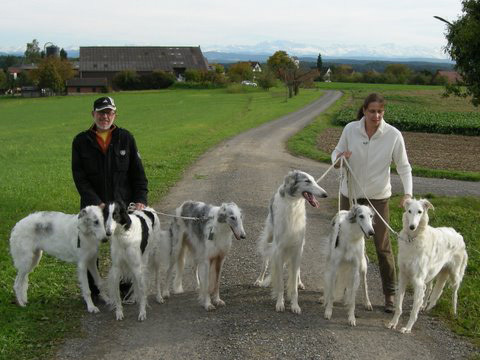 At the moment, five borzois are living with me. I try to come up with the old Russian, thick haired type, without any exaggerations in any way. My borzoi should be built correctly and harmoniously with nice proportions and lines. The body should be functional, so that he is still able to chase. That is for me the beauty of this breed: to see the functionality of its anatomy, combined with a lot of expression and nobility. The thing I appreciate most in a borzoi is his calmness and well-balanced behaviour, his soft- and tenderness, his sensitive manner he shares with us and his dignified and aristocratic expression. We live in the lovely village Truttikon, situated in a vine-growing region in the idyllic Zürich "Wineland", between Winterthur and Schaffhausen, about 35 km away from Zürich. Our region is wellknown for excellent wines and from our house we can see the vineyard of the best winegrower at the place. More information about our village under www.truttikon.ch. 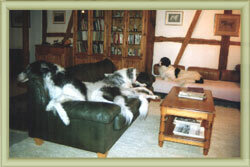 Our house is at end of the village, surrounded by orchards and fields which invite to long walks with our dogs. Moreover, the dogs have a fenced in garden of about 1300 m2 to their disposition. Walk with friends in October 2008: In the background our village. On this day, a part of the alps was also well visible. "You can live without a dog, but it's not worth it." 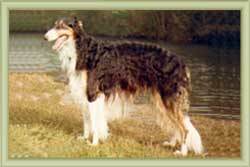 The first Borzoi is probably always something very special for the new owner. 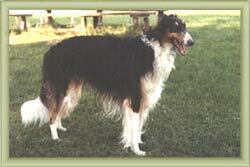 My first Borzoi was VORENOFF TARAK, born September 29, 1979, bred by Jo Heller, Holland. At that time he had the rather «exotic» tricolour and I suppose therefore he had it quite difficult at shows. Tarak reached the age of 10 years, when he had to be put to sleep because of cancer.